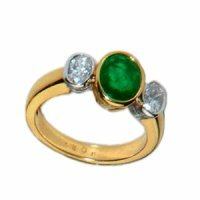 Timeless Oval Emerald & diamond Three Stone Ring. An Admirable Emerald Ring designed as an Emerald & Diamond 3 Stone Ring. This Delectable ring is composed of an Oval Cut Emerald, set between two Oval Cut Diamonds that are mounted in 18 carat White Gold, the rest of the ring is mounted in 18 carat Yellow Gold with a Rub-Over Setting. There are two Oval Cut Diamonds in total weighing approximately 0.78 carats and Oval Cut Emerald weighing approximately 1.62 carats. With this ring you get the best of both worlds, you get the traditional three stone style in a modern two tone design. 18k - 750.